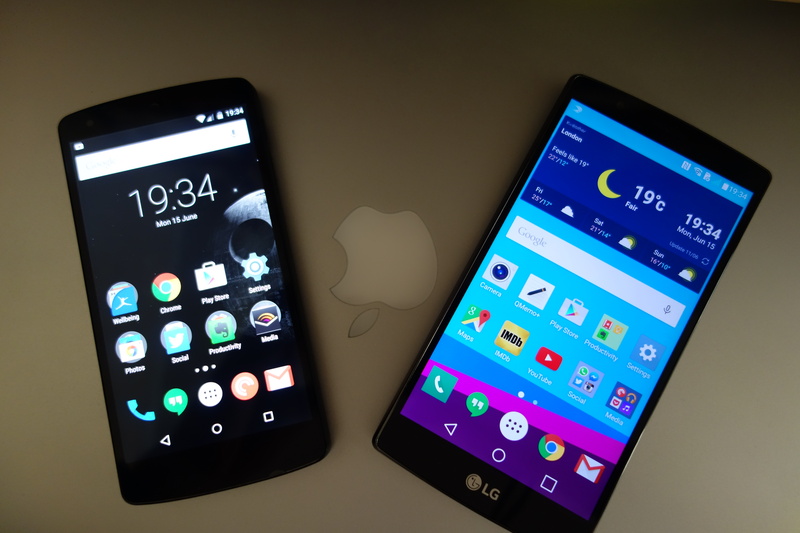 The LG G4 – the best Android smartphone of 2015? Smartphones are not only getting smarter, they’re also getting bigger. It was only a couple of years ago that my old iPhone 4S felt like a premier device that could do almost anything. Now, after spending a lot of time using a Nexus 5, the diminutive iOS handset seems more like something out of Zoolander than a phone that grown ups can use. Of course Android phones were the first to make the leap into larger forms, with most of the top models for the past few years dwarfing Apple’s offerings. Samsung even introduced a new category of device with its Note range, causing the creation of a word the world could truly do without – the Phablet. What was wrong with the Tahone? It sounded far more exotic and less like a marital aid, but them’s the breaks. Now LG has recently updated its flagship range with the new G4, a powerhouse device with many excellent features…but, has the craze for size actually hampered this design? Having spent the last eighteen months using a Nexus 5 as my daily driver, I’m not one to eschew the delights of a bigger handset. Admittedly it did take a little getting used to initially, but now I’d regard the 5″ device as probably the optimum size. It’s big enough to enjoy the web, videos, and reading, but not so much that you can’t reach anything on the screen or feel like you’re holding a tea tray to your head when you make a phone call. Important stuff. The LG G4 comes in at 5.5″, which might not sound like much, but actually makes quite a difference. In the hand it’s heavy, although not uncomfortably so. The body and screen are gently curved, which does make it sit well in your palm, but on this Korean model I reviewed the current genius trend for making expensive, mainly glass devices, incredibly slippy is in full force. For the first few days I was terrified of the G4 leaping from my grasp at any moment, so much so that I avoided taking it out of my pocket if I was walking down the street. Those who live in plush, green fields, or never leave the confines of a deeply carpeted house, will avoid these stressful issues, although static electricity could become an issue in the latter. LG does offer a leather backed version, which would certainly go a long way to solving this issue, but if you opt for a more standard model you’re definitely going to need a case, or at least some sedatives to avoid a heart attack. While you can use the G4 one handed, it’s not really ideal. The reach is just too big for my average sized hands even with Android’s sensible placement of navigation buttons. To compensate for the larger frame LG has once again opted to place the power and volume buttons directly on the back of the unit rather than the side, just like on the G3. While this does make them easier to reach, it also makes them impossible to see, and I found myself feeling around for them unsuccessfully on more than one occasion. Maybe with more time you would get used to it, but for now I find it somewhat awkward. LG has skinned Android on the G4, but it’s nowhere near as aggressive as Samsung or HTC’s offerings. 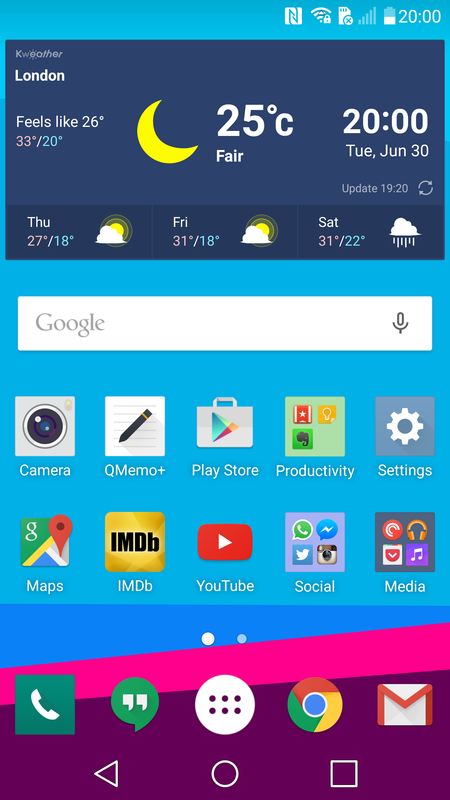 The icons, settings, and general feel is clean and light, with a recognisably Android feel. Swiping left from the home-screen reveals a news stream app, rather than the Google Now page that is so useful on stock Android. Of course the Google Now launcher is freely available, and I did download it to regain my purist badge, but it’s only applicable to the top layer, as the drop down settings menus still remain the LG defaults. That’s not to say they’re bad, not at all, and after using the handset for a week or so I was whizzing around like a native. One excellent feature I liked was the tap to wake function, in which you simply double tap the screen and it will act as if you’ve pressed the power button. It worked for me about 70% of the time and was an easy way to quickly check notifications and even the time without picking up the device. So, the screen’s too big, it’s too heavy, slippy, and the UI isn’t as good as it could be. Surely that’s a pretty damning opinion of the G4? You see many of those objections are down to personal preference, clouded by my love of Google’s Android UI. If you want a larger phone but don’t quite want the step up to phablet territory, then the G4 is a very impressive unit. The display is bright, crisp, and is a fine place to watch YouTube or surf the web. Touch responses are accurate, and the whole interactive experience is fast, smooth, and easy to use. Battery life is fantastic. On my Nexus 5 I usually finish the day with about 20% remaining, less if I’ve used it heavily that day. For the couple of weeks with the G4 I hardly ever got below 50%. The one time I managed to drain it involved travelling all day, making a few calls, moving between wi-fi antennas (always a drain on a battery) and taking about one hundred photographs in a dark room. Even then I still got home at around 1am with 5% left. Oh, and the battery is removable, so if you do manage to burn through it, you can always pop in another. While you’re at it, slap an SD card in there so you can take even more photos. 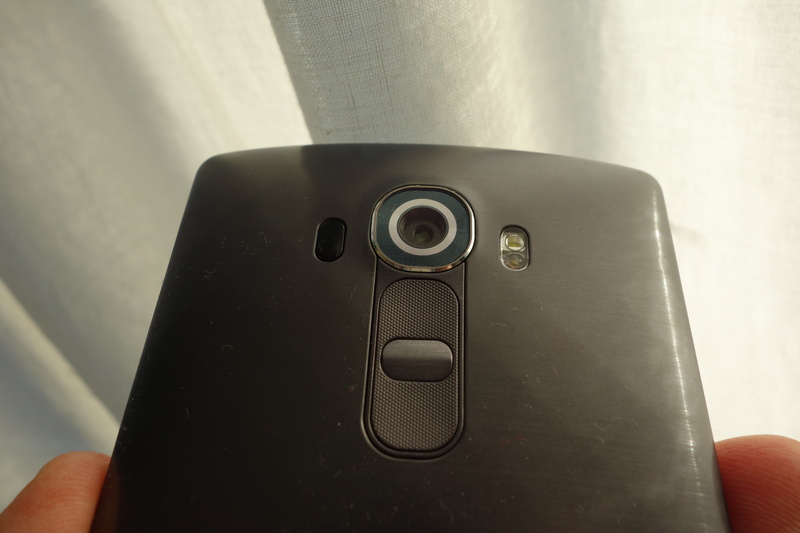 The camera, though, is the prime reason for buying a G4. It really is about as good as it gets on mobile phones at the moment. 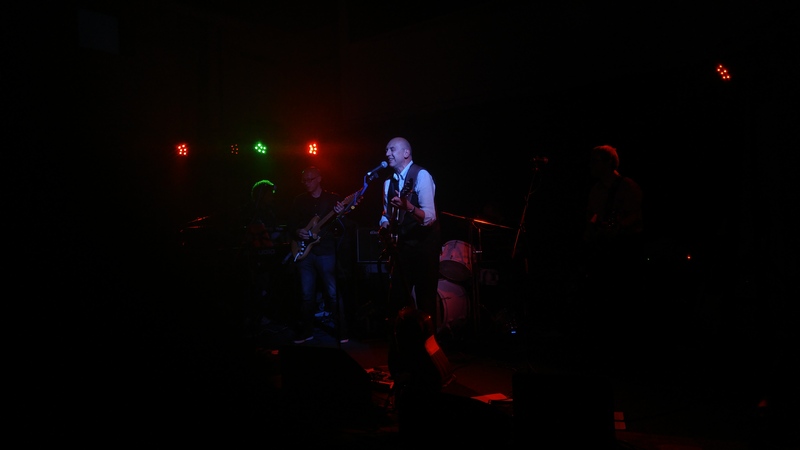 Using the device at a gig, with the usual challenges that low lighting and fast moving subjects presents, I still managed to get some really decent shots. This is mainly down to the extensive manual mode that the G4 offers. I even used the digital zoom, which on most units returns awful results, and snapped a couple of cool atmospheric images. Seriously, this camera is brilliant. 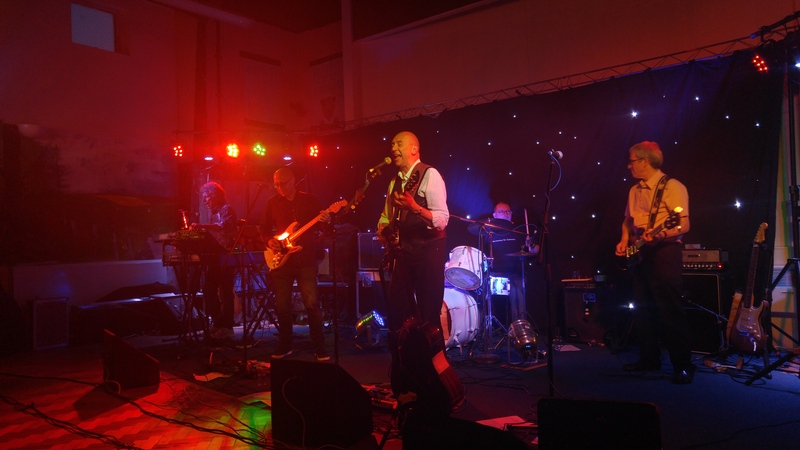 At full zoom, in changing stage lighting, and with the subjects moving. The LG G4 is an excellent, premium smartphone that delivers pretty much anything you want from an Android device. It’s powerful, fast, has a lovely display, and that camera, oh yes. It surprises me then that I just don’t feel much love for it. I think the size feels too big to be truly comfortable in my hands, and while the UI is snappy and well laid out, it’s not as simple as a Nexus. I had hoped to upgrade to this model from my Nexus 5, which of course was made by LG, but I think I’ll hold onto that model for a little longer yet. These are just personal gripes though. The G4 will be an incredible phone for most people and should certainly be at the very top of the list for anyone who wants a larger handset. Prices seem to be less than iPhones and Samsung G6s at the moment, and for the money I think you’d be getting a real bargain. Over the past few years more and more of us have become increasingly reliant on mobile technology. The power of modern phones and tablets are such that they can replace many of the tasks that had previously been the preserve of traditional PCs, while being small enough to fit in our pocket. They’ve revolutionised the way we work, communicate, and play pictionary style games across a worldwide network. But this new found freedom presents a problem that has become somewhat of an obsession with manufacturers : how do you increase the power of a battery? Look inside many of the top smartphones and you’ll see that a sizable proportion of the internal space is packed with as much lithium-ion as the case will hold. The amount of hours that a phone, tablet, or laptop can run on a single charge is now listed with pride among the technical specs. For example, at the recent Apple keynote the crowd (or at least the first few rows of Cupertino faithfuls) gasped and cheered when Phil Schiller announced that the new MacBook Airs had effectively doubled their battery life. This makes sense of course, because the longer something lasts the more you can get done. It also spares us the potential social embarrassment of soliciting strangers in coffee shops who happen to be sitting next to the only available power socket. It isn’t just longevity that poses a challenge at the moment. There’s also the issue of size, and flexibility. The slab like nature of our phones makes them very practical when typing or navigating a hero away from the onrushing clutches of Temple caretakers. This advantage ends the moment we forget that the device is in our back pocket and sit down. Then, while the deft hands of nurses wield their tweezers with skill, we’re left wondering what life would be like if our technology could bend? Wearable devices are the next big thing on the horizon, and the types of inventions being imagined are incredible. To work well though they’ll need to blend seamlessly with our clothes, which means no battery packs stabbing into our ribs or flapping about as we briskly pursue happiness. That’s before you even consider the aesthetic issues of bulging, warm areas about our person. With these challenges in mind manufacturers are turning to the new wonder material of the digital age, one that could have a profound effect on how we design and power devices in the future – welcome to the world of Graphene. Make no mistake, Graphene is high end science. In fact the Manchester University academics Andre Geim and Konstantin Novoselov who successfully isolated the material in 2005, both received the Nobel Prize for their efforts. 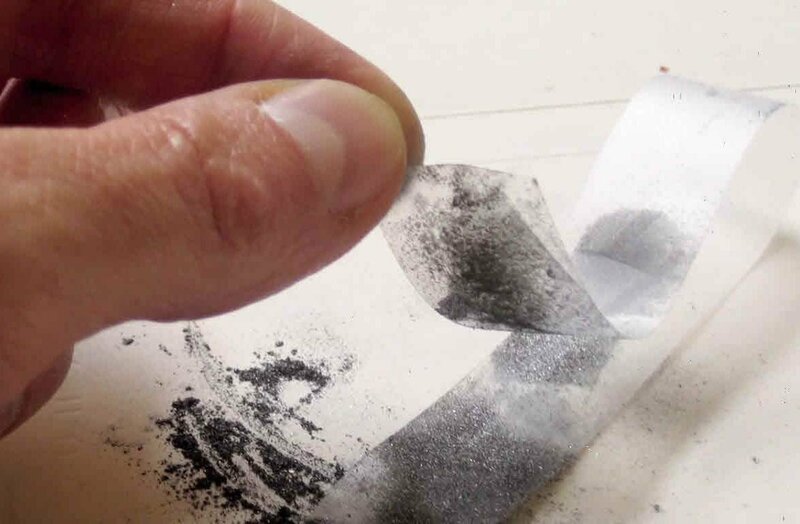 Although the method of production they devised – taking graphite and peeling it with scotch tape – does seem a little bit like a make-and-do session at a primary school. It also precludes any kind of mass production, so researchers like Dr Kaner have been exploring other ways of creating the valuable substance. Oddly enough the one they came up with still feels somewhat home-brew for such an advanced area of study. This might sound like something conducted in the depths of a super high-tech lab, but the laser is nothing more than a standard, consumer grade DVD drive, and the plastic sheets are fed into it as you would a normal disc. When they come out, the graphene is peeled away from the DVD surface to reveal a thin, durable, film. ‘The real exciting discovery,’ Kaner reveals, ‘ was when Maher [scientist at UCLA] dragged me into the lab. He said ‘take a look at this’ and he took a lightbulb and just turned it on with this little piece of graphene. But the amazing thing is that it doesn’t stop working. After charging this sheet for two or three seconds he ran this light for over five minutes. I thought we had something very important. I thought the world had changed at that moment’. 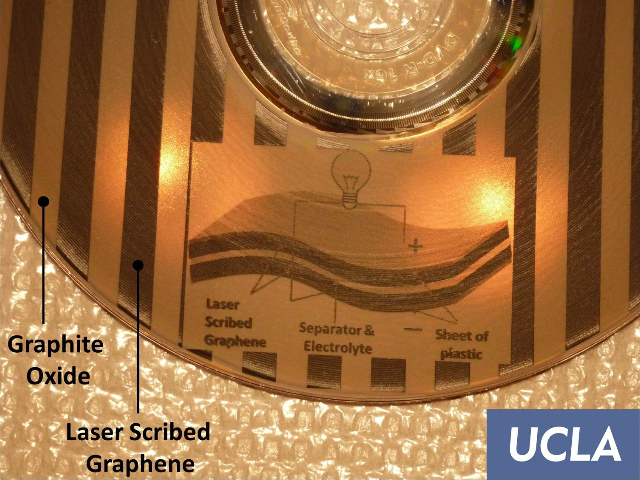 What Kaner and Maher had discovered was that graphene has the ability to be a supercapacitor. Traditionally batteries are able to hold large amounts of charge that they release slowly, but this also means that they recharge slowly – as any one who notices just before leaving for work that they’ve forgotten to plug in their smartphone over night will attest. Capacitors charge much quicker, but they can only hold small amounts of storage, so they wouldn’t last long in the demanding world of power hungry 5” screens. A supercapacitor, as the name suggest, retains the rapid charge times but increases the amount of storage available, which is a quite formidable combination. The upshot of this is that you could plug your tablet, laptop, or phone into the power socket for a couple of minutes and have it completely charged and ready to go by the time you’ve put on your coat. Forgetful people of the world would rejoice, while third party battery pack manufacturers would have to consider a new area of trade. Alongside the ability to charge quickly and last for hours, graphene also provides scientists with an opportunity to address the main other problem that traditional batteries exhibit, mainly that of reduced capacity over time. Basically the way a battery works is that you have an anode at one end and a cathode at the other. In the middle is an electrolyte which allows the electric charge to flow between the two points. When one of these elements begins to degrade the battery itself loses the ability to retain a charge. The Pacific Northwest National Laboratory has been researching ways to improve batteries in response to the US Department of Energy’s desire to convert its transportation fleet to electric powered vehicles. The method they discovered was one was where the previously destructive tin oxide anode material was placed between graphene sheets. ‘The graphene sheets function as a good conducting material to connect the electrons in the battery,’ says Dr Jun Liu from the PNNL, ‘at the same time, when you charge/discharge the electrode material the tin oxide will expand and shrink. However because they are sandwiched between the graphene sheets the whole material doesn’t fall apart. Therefore you retain the good stability’. The conductive and transparent nature of graphene also lend themselves to the production of displays, something that phone manufacturers are beginning to see as a real possibility. Prototypes of flexible graphene screens have already been created by Samsung in its Sungkyunkwan University, and you can be sure that other companies are investing heavily in this technology. The British government has even allocated £21.5 million to various UK universities involved in graphene research, which has been matched by industrial partners such as Rolls Royce, BAE Systems, and Dyson. The stage is now seems set for the graphene revolution to take place, but of course like most miracle materials that grab the headlines the actual realisation of these dreams may still be a little way off yet. While you might not be folding up your Samsung Galaxy 6 or charging an iPhone 7 in under five minutes, the models that follow soon after them may well offer these features as standard. Just as the idea of rewinding a film after you’ve watched it seems alien and archaic to a generation raised on PVRs and DVDs, overnight battery charging or cracked screens could well become another curiosity in the museums of the tomorrow. This article originally appeared on the PC Advisor website and in the print magazine as part of a monthly section I write entitled News Viewpoint. To see that version please click here, or purchase a copy of the fine magazine from your local newsagent.